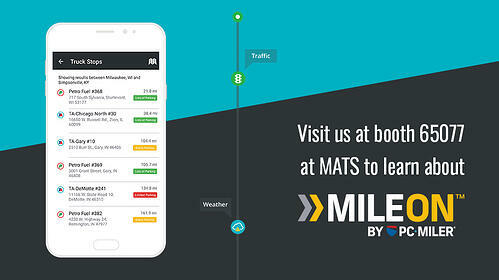 In less than a week, we’ll be at MATS, the Mid-America Trucking Show, for a few fun-filled days in the Kentucky Exposition Center, debuting some new product features and offering a great show promotion for our powerful driver trip planning app, MileOn by PC*MILER. We’re excited to show off our new parking availability feature that helps alleviate stress when trying to find safe, convenient truck parking. 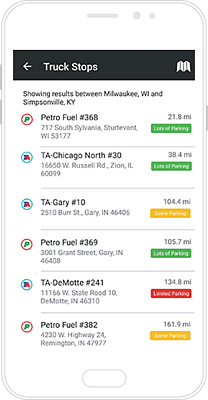 Currently available in 8 states, simply click on a truck stop and see the overall parking availability (Lots of Parking, Some Parking, etc.) along with the number of open spots. Through our TPIMS (=Truck Parking Information Management System) partnership, all information is part of a live feed, so you don’t have to rely on outdated, crowd sourced data. We’re giving away exclusive codes at the show that will give drivers free access to MileOn’s premium level features, like intelligent hours of service break planning, weather display, and planning trips with real-time traffic. Have 25 Minutes for a $25 Gift Card? We want to make sure our users have the most relevant features and best experience possible. As a user, we want to see how you use the app. That will help our team deliver the best quality app with features you need. If you’ve got 25 minutes, set up some time to meet with our MileOn User Experience Manager. Then, get coffee and donuts on us. See you at MATS, booth 65077! For more information on all of our solutions for professional drivers, owner operators and small fleets, visit our Driver Solutions website.